Hopefully. Always many issues integrating engine & stage. First hops will lift off, but only barely. First (really short) hops with one engine. Suborbital flights with three. We decided to skip building a new nosecone for Hopper. Don’t need it. What you see being built is the orbital Starship vehicle. THE WOODLANDS, Texas — SpaceX could begin initial tests of a prototype of the company’s next-generation Starship vehicle as soon as this week, Elon Musk said March 17. 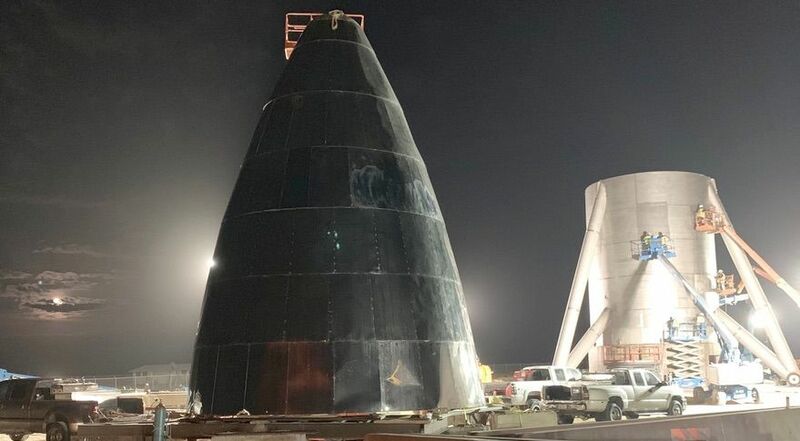 In a series of tweets, Musk said flights of a "hopper" test vehicle, powered by a single Raptor engine, would "hopefully" begin this week pending work to integrate the engine, which arrived at the company’s South Texas test site late last week, with the vehicle. Residents of a housing subdivision known as Boca Chica Village, near the test site on the Gulf of Mexico coast east of Brownsville, Texas, received a notice Friday from local officials informing them that the company could start testing "as soon as the week of March 18, 2019," according to copies of the notice posted on social media. The notice said that a “safety zone” perimeter would be established for those tests, including checkpoints on the road leading from Brownsville past Boca Chica Village to the SpaceX site. Asked on Twitter if the tests were in fact scheduled to begin this week, Musk replied, "Hopefully. Always many issues integrating engine & stage. First hops will lift off, but only barely." Past statements from Musk, as well as regulatory filings from the company, have indicated SpaceX plans to carry out an incremental test flight program using this vehicle, with very low altitude tests that, over time, will go higher and faster. Those tests will use a single Raptor engine, although Musk said later “suborbital” flights will be powered by three such engines.